The ICC Theatre Program 2016-2017 season of four shows gets underway with the comedy farce The House of Blue Leaves, which opens on September 23 for six performances in the main stage theatre of the ICC Performing Arts Center, located on the East Peoria Campus. Written by John Guare, The House of Blue Leaves takes place on a day in 1965 in the New York borough which is home to a middle-aged zookeeper. The show portrays events that take place in the main character’s family on this day, which turns out to be a wild combination of a lifetime of dreams and realities. The show takes place September 23-25 and September 30-October 2. Performances on Fridays and Saturdays begin at 7:30 pm and Sunday matinees begin at 2:30 pm. The lead character in The House of Blue Leaves, Artie Shaughnessy, is a songwriter with visions of glory. He toils by day as a zookeeper and suffers in seedy lounges by night, plying his wares at piano bars in Queens, N.Y., where he lives with his wife. On the day the Pope is making his first visit to the city, Artie’s son goes AWOL from Fort Dix and devises a plan to bring fame upon himself by getting his name in the news. Mix in a mistress along with a visiting school-chum-turned-successful-Hollywood-producer with his starlet girlfriend in tow, the protagonist’s promise of glory evaporates amid the chaos of ordinary lives. Cast members in The House of Blue Leaves, their roles and their hometowns include: Austin Shaw of Washington as Artie Shaughnessy; Andrew Gray of Washington as Ronnie Shaughnessy; Vanessa Hesh of Pekin as Bunny Flingus; Gillian Strachan of East Peoria as Bananas Shaughnessy; Amilia Dierks of Morton as Corrinna Stroller; Brit Pearl of Hannah City as Head Nun; Daisy Breitbarth of Metamora as Second Nun; Cass Bermijo of Green Bay, Wisc., as Little Nun; Alek President of Rushville as M.P. ; Nate Elder of Dunlap as The White Man; and Frank Drew of Peoria as Billy Einhorn. The ICC production is directed by Doug Rosson. The show is rated PG-13 for adult themes and is produced by special arrangement with Samuel French, Inc.
Tickets cost $7 for the general public and $5 for students and senior citizens. Murder at Café Noir by David Landau, a comedic “whodunit” tribute to the Bogart era which includes audience interaction/participation and four special Friday and Saturday “dinner theatre” performances. 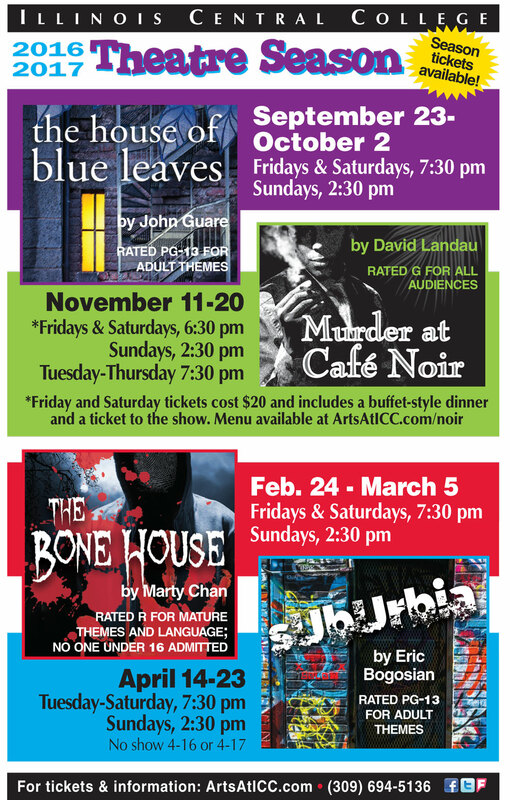 Nine performances between November 11-20 in the studio theatre. Rated G for all audiences. The Bone House by Marty Chan, a bone-chilling and suspenseful, immersive thriller which delves in to the public’s fascination with serial killers. 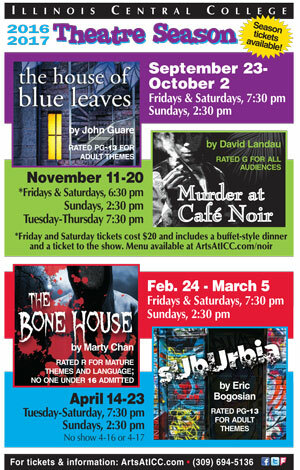 Six performances between February 24-March 5 in the mainstage theatre. Rated R, no one under 18 admitted. Suburbia by Eric Bogosian, a young, tough suburban drama examining the lives of a group of rage- and angst-ridden 20-somethings in a small town. Eight performances between April 14-23 in the studio theatre. Rated R for adult themes and language. Tickets for all shows other than the four dinner theatre performances of Murder at Café Noir cost $7 for the general public and $5 for students and senior citizens. The four dinner theatre performances of Murder at Café Noir begin at 6:30 pm on only the Fridays and Saturdays during the run of this show. All tickets to the dinner theatre performances cost $20 per person and include a buffet-style meal. Tickets for these four dinner theatre performances must be purchased at least four days in advance. A menu is available at http://www.ArtsAtICC.com/noir. Season tickets cost $24 for the general public and $16 for students and senior citizens. Season ticket purchasers who choose to attend a dinner theatre performance of Murder at Café Noir must pay an additional $15 per person for the dinner.